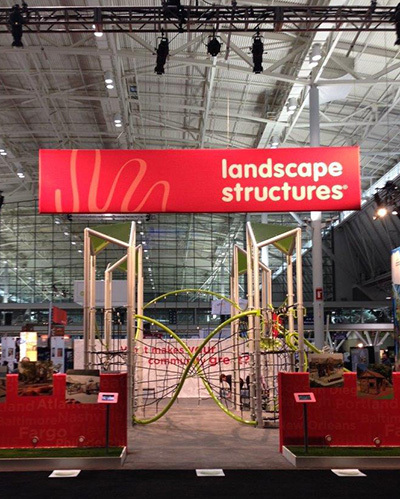 Last weekend, we were in Boston, Mass., to participate in the 2013 American Society of Landscape Architects (ASLA) Annual Meeting & Expo. 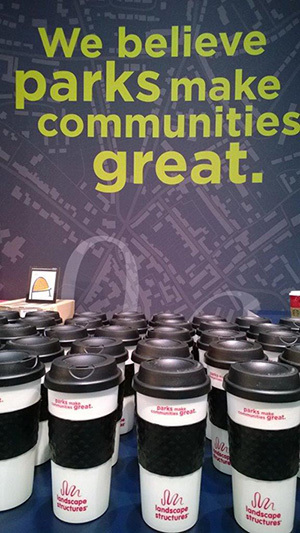 The theme of our booth this year was “We believe parks make communities great,” and it featured our newest playground innovation, GeoNetrix. Visitors to our booth were able to get a first look at the iconic playstructure. The dynamic nets, contemporary towers and colored, translucent polycarbonate roofs of GeoNetrix enticed attendees to stop by for a play break and test the new playground innovation. Landscape architects were so captivated by the structure that they voted our booth Best Visual Appeal. In addition to our booth, we were proud to sponsor the Opening General Session speaker, Jack Dangermond, founder of Esri, who spoke about geodesign and the emerging GIS platform. We also sponsored the ASLA/Landscape Structures Gala at the Boston Children’s Museum, which offered hands-on activities, farm-to-table dining and dancing. We had a great time in Boston visiting with landscape architects, hearing from industry experts and taking in the nearby attractions. Our employees and playground consultants are already looking forward to 2014 ASLA in Denver, Colo.! This entry was posted in Community, Contemporary, Custom, Design, landscape architects, Multisensory, Play Environment, Playground and tagged ASLA, Boston, Boston Children's Museum, Denver, GeoNetrix by PlayLSI. Bookmark the permalink.